Open plant, bearing 4-6 fruits per node, with self-prunning laterals. 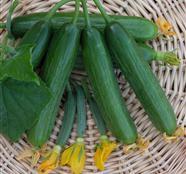 The 15 cm long fruits, have nice slight ribbing with a shiny green color, and a crunchy taste. Omar F1 is a high yielder and maintains its fruit quality after prolonged harvest, due to its viral and fungal disease packages.